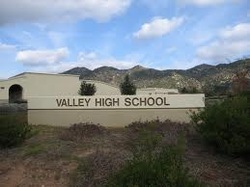 Valley High School is located in Southern California in the coast of the city of Escondido.Escondido is an urban environment surrounded by mountains and hills and is also known to be the city that is the heart of San Diego. Located approximately 30 miles northeast of San Diegoand 18 miles inland, Escondido is home to a population of over 140,000 residents. According to the 2010 census, the racial makeup of Escondido is comprised of 60.4% White (40.4% non-Hispanic white), 2.5% African American (2.1% non-Hispanic black), 1.0% Native American, 6.1% Asian, 0.2% Pacific Islander, 25.4% from other races, and 4.4% from two or more races. Hispanic or Latino of any race were 48.9% of the population. Over 8,000 students attend classes at one of four high schools in the Escondido Unified School District. The school’s mission statement captures the essence of the staff’s commitment to student learning. It is consistently communicated to students and parents, is posted in classrooms, and is included in written school communications. Most students enroll at Valley High School because it offers a program that meets their individual needs. You will find a friendly and caring staff that will help you meet your educational and personal goals. Advantages of attending Valley Include: smaller classes, personalized instruction, cooperative learning, individual and group counseling by school district staf and community agencies, standards-based learning, multi-cultural emphasis that prepares you for post-high experiences,technology integrated curriculum,team process as an integral part of student learning. Valley High School is the district’s continuation high school and serves from 375-425 students on a daily basis throughout the school year. Valley’s philosophy since its inception has been to provide an environment and opportunity for success to students who have previously been unsuccessful at their former high schools. The mission statement reflects the school-wide commitment to this philosophy. The main objective is to provide students with the academic and life skills necessary to earn a high school diploma, prepare for community college or other specific post-graduation training and ultimately fully participate in their community while continuing to plan for future pursuits. programs that promotes student success both in and outside of the classroom. who met all credential requirements in accordance with State of California guidelines. Before and After School Programs "Second Chance"
Students at Valley High School frequently come from economically disadvantaged backgrounds. Currently, 288 students receive free and/or reduced lunches. The district food service administrators make every effort to ensure that all eligible students are served and school staff distributes the application several times during the year at parent meetings, presentations and in classrooms. Spanish is the primary language of 229 of Valley’s current 419 students. Of those students, 44 have been reclassified as Fully English Proficient (FEP) while in high school. 91 are still classified as Limited English Proficient (LEP) or a transitional stage. Valley continues to provide a formal English Language Development Program. ELD students also receive support through the ASSETs Grant after-school tutorials which are taught by Valley teachers who are 100% CLAD or SDAIE certified. The Valley staff continues their training in the instruction of English Learners through Advanced SDAIE Training offered at staff meetings. COMPACT, provide teen centers with computers and tutoring to help students with academic and social growth. The city also built a skate park in Kit Carson Park and the YMCA opened a teen recreation center. The City of Escondido had four full-time school-police liaison officers to support the city’s elementary and high school districts. These officers provide regular traffic safety presentations and assist school officials in dealing with graffiti and other school related crime. The five students with differentiation needs are Elena, Alex, Dexter, Julie and Sabien. These students represent the diversity of the school with their cultural backgrounds, learning styles or needs and individual strengths.